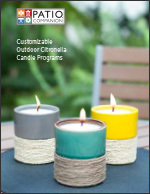 Is it time to light up your outdoor décor citronella candle sales with fresh new products? Are you tired of offering the same old bug buckets and oil torches with no design or aesthetics? Our national brand of Patio Companion®; citronella candles goes beyond the basics to give you attractive and practical outdoor candles to entice your customers into dressing up their back yards on a regular basis. Incorporate the latest trends into your candle offerings by easily customizing your category (or package). Product customization can traditionally be expensive and difficult, but our experienced design and manufacturing team are dedicated to provide innovative products at great values. Whether it be wax or vessel color, patterns in wax or packaging, or brand new design tailored to accent your next year’s outdoor living program offerings, we can handle it all. We have more than 25 years of experience in private label designs. Brand guidelines are no problem for us! Patio Companion packaging can be tweaked to incorporate fun background patterns, different colors and styles. Detailed descriptions of the Patio Companion line of citronella candles, lanterns, and torches to complement a wide variety of personal styles and help create comfortable and stylish outdoor spaces for families who want to bring their personal style into their outdoor living areas. 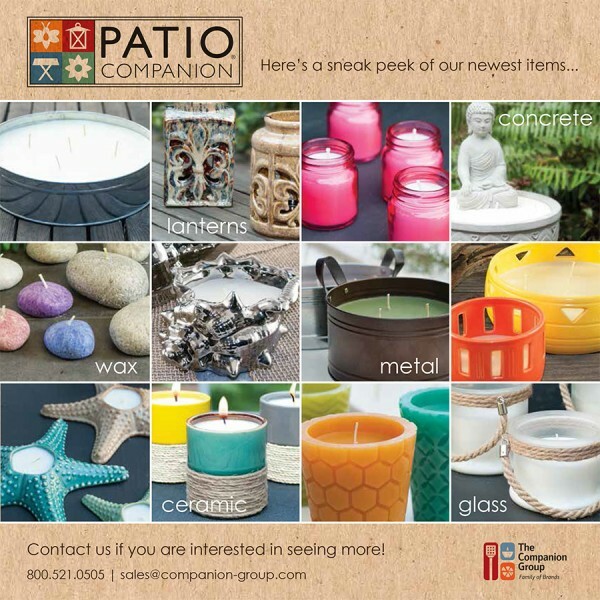 If you are interested in Patio Companion products and have additional questions, contact sales@companion-group.com, call us at 800-521-0505 or complete the contact form below.